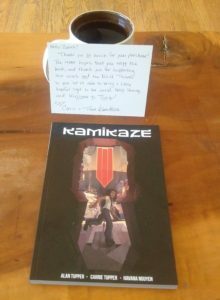 Earlier this week, I came across a tweet stating that Team Kamikaze would be giving the profit from books sold until Feb 5th to the ACLU. Being as I’m a big supporter of the ACLU and need very little persuasion to buy a new read, I jumped on it and ordered a copy. Marvelously detailed, I thought that even as I read, so getting to the end and finding a whole notes section on the details of the comic was amazing. This thing is seriously well thought out, which maybe shouldn’t be surprising since the forward says the ultimate goal is to become an anime. I was impressed. The art is really gorgeous. I tried to pick a picture that wouldn’t count as a spoiler, but take a look at this. Totally rockin’ my world. The story is interesting, the themes pertinent and the cast diverse. I have no complaints beyond the normal ‘but it’s only a first volume.’ I’ll be looking for more, for sure. Lucky for me it’s a webcomic and I can in fact find more. You still have a day or two (I don’t know if it’s until the start or end of Sunday) to order your own copy and support the ACLU. But even if you miss that offer, I have no hesitation about suggesting you get a copy of your own. 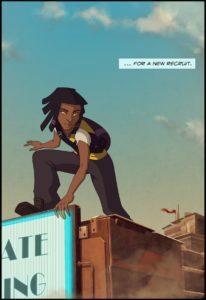 This entry was posted in books/book review and tagged #ReadDiverse2017, manga/comic on February 3, 2017 by Sadie.